They sometimes call the cauliflower the “tree of life” because of it’s bountiful health benefits. Pair it with turmeric and you have got a double whammy! I love the beauty of the cauliflower “tree”. You can get between 2-3 steaks out of each head of cauliflower. I usually cut 2 thick steaks out of the center so they are nice and sturdy, and easy for handling. This recipe also works well for the grill. I throw the remainder of the cauliflower into the food processor and pulse it to make cauliflower rice for another meal later in the week. This is a nice alternative to meat if you are preparing a meal for a vegetarian or do “meatless mondays” with your family. In a small bowl, whisk together olive oil with the spices. Gently brush spice mixture on the cauliflower steaks, completely coating each one. Place on sheet tray and roast for 25-30 minutes, until golden brown and cooked thru. These are sooooo good. Thanks for sharing. What a wonderful way of serving cauliflower and it certainly looks like the tree of life. 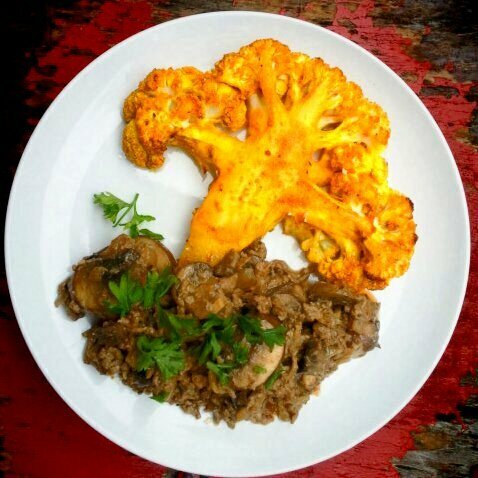 In the roasted cauliflower picture, what were you serving with it?